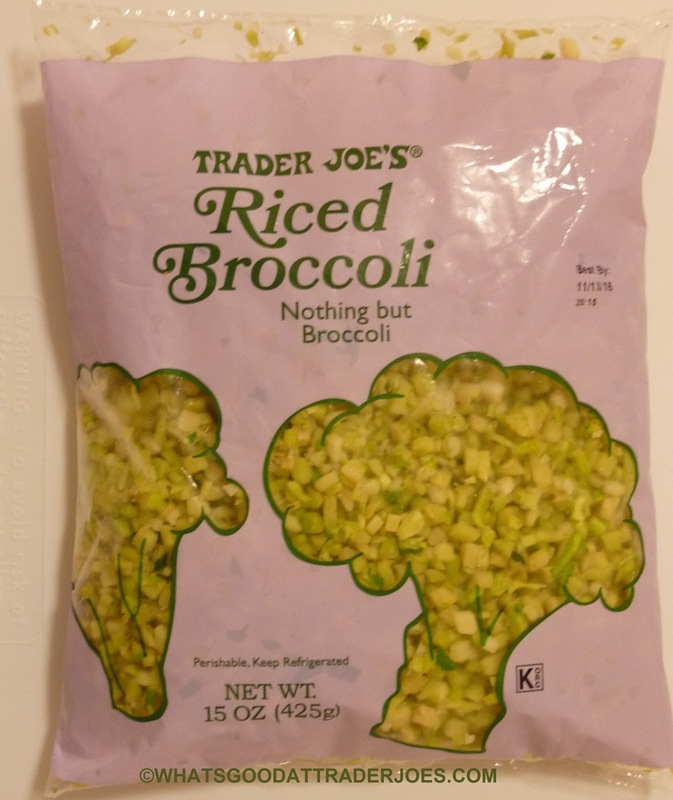 I don't really have a whole lot to say about this product, since it's nothing but broccoli—and my feelings about it are very similar to my feelings about traditional broccoli. I don't hate broccoli. Never did. But I've never loved it either. It needs a little "help," if you know what I'm saying. A little butter, salt, and pepper really add a lot to the flavor of this product. Or, if you're trying to avoid sodium, a few shakes of the 21 Seasoning Salute can also be a big help. On the other hand, if you're not really watching what you eat, but you still want some "greens" in your diet, this product is delectable when served with melted cheese, much like traditional broccoli. 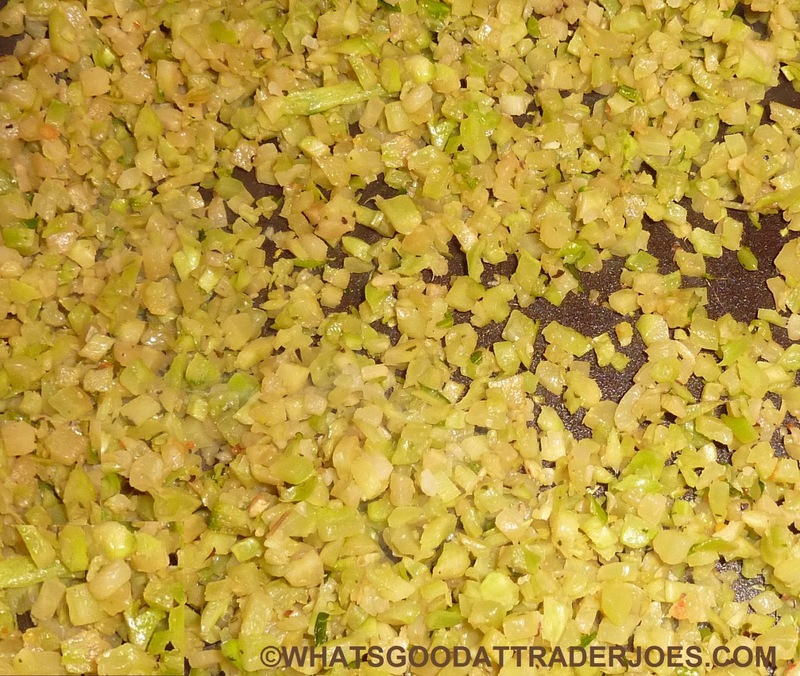 You may remember the previously-reviewed Organic Riced Cauliflower. We tried it around the same time the Shelly family reviewed it, and it's become a repeat-purchase in our household ever since—whenever it's not sold out at the local Trader Joe's, that is. Cauliflower works shockingly well as a rice substitute. And it seems to work without adding much to it. We usually cook it up in a little olive oil, and that's really all that's needed to make it a very palatable side dish. For Sonia and I, this broccoli didn't work quite as well just by itself. Plus, it might just be some silly subliminal, psychological thing, but it's a lot easier to pass a vegetable off as "rice" when it's white, rather than green. 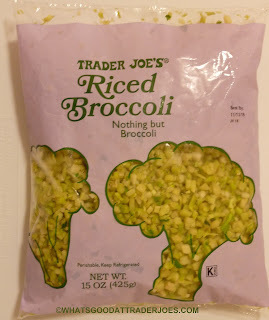 While chatting with Marvo from The Impulsive Buy one evening, he asked us, "What do you think Trader Joe's will 'rice' next? Beets?" He noted that TJ's likes to do interesting stuff with beets. (See: chips and juice). Sonia suggested something at the time, but she can't remember what she said. Jicama, maybe? Personally, my money is on parsnips or turnips. I'd like to see them rice up one of those. How about you guys? Let us know in the comments below. Sonia gives this riced broccoli three stars. I give it three and a half. It could be a really slick way to sneak some extra veggies into that Thanksgiving meal you're about to have. While I love their cauliflower rice and I love broccoli, I couldn't even force myself to eat this one. They've clearly used the stems to make this product and while broccoli stems taste great, you have to peel them first or you might mistake them for wood shavings. Maybe I got a bag that was particularly woody, but it was an inedible waste of time and money. Yeah a few bites of ours seemed "woody," but for the most part is wasn't too bad, texture-wise. we just finished a bag and it was tender and delicious. Yes, this would be awesome in stir-fry! Dippin Brocs — The Veggies of the Future! I didn't like this at first but have changed my mind with second try. It needs to be cooked longer than cauliflower rice. I steamed it until soft, sautéed onion, added broccoli rice, salt pepper, grated cheddar and added cooked chicken. It's actually just a broccoli rice casserole but we enjoyed it. I think the cauliflower rice is more versatile. I'm going to keep working with this though. Your broccoli rice casserole sounds yummy. 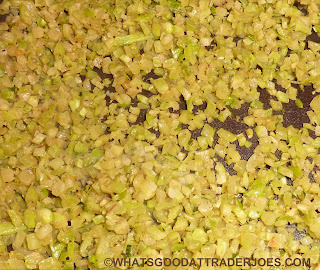 I was really cranky about this the way i am about the broccoli slaw- it's a ton of the outer woody stem shards!! Ick! I sautéed it forever and the woody bits never got soft enough that it was edible. I would buy riced carrots, especially since the shredded carrots TJs are too thick. Seriously! They're fine cooked or in soup but too thick for salads as is. Actually they should sell a riced veggies mix of cauli/carrots/broccoli....!! Amen! Without the tough outer peel it would be delicious. Perhaps I got a bad bag, but it was entirely comprised of the woody outside. Your idea of riced parsnips or turnips would be wonderful. I love both but hate peeling anything. Something I could just shake out of a bag and heat would be very a-peeling. I sauteed it in a little bit of garlic infused olive oil with some salt pepper for 5 minutes. I added a fried egg over easy on top and it was delicious! My coworker introduced me to this. She uses this with spinach, avocados, Quattro Framgio cheese, and spicy thai peanut vinaigrette to make a salad. All items from trader joes. It's really delicious i bet you haven't had a rice brocoli salad yet. It's more filling than a leafy salad. I'm trying the broccoli slaw instead because it's organic. The broccoli rice was fine, though you need to cook it longer. I throw on tomato sauce, fake ground beef, and cheese and sometimes brussel sprouts as pseudo-meatballs and throw it into the microwave for two or three minutes. I think TJs needs to move to Zoodles next as zucchini noodles are already popular and are low carb and cook quickly.